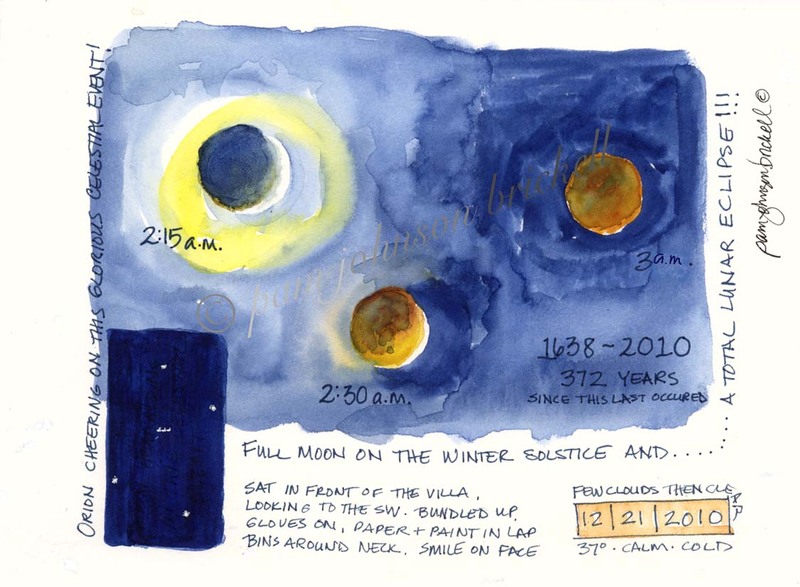 South Carolina LowCountry Nature Journaling and Art: Full Moon, Winter Solstice and oh by the way... a Total Lunar Eclipse! Full Moon, Winter Solstice and oh by the way... a Total Lunar Eclipse! The weather report looked good. On the cold side, though (okay.... cool for you folks in the north) . I knew I'd have to be wearing my gloves. At least I could get away with the thinly lined Isotoners. I set the alarm for 2 a.m., but like all times when I have to get up unusually early, I really didn't get any sleep - I was up and out by 2! I was soooo excited, I decided to somewhatly plan my journal page. This is a first for me and I must say from now on, I'm just going to let the page just happen. I selected Fabriano soft press - new to me. I laid out my supplies, had all my clothes ready to go, along with camera, monopod and bins. Ahhhhhh! Clouds! Cottonball puffs all over the place! But, at least there was some space between them and by 2:30 they dissipated. The eclipse was well underway - just about a quarter of the moon was visible. There was a colorful ring around it, too. 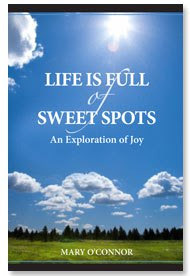 I decided to used the upper left of the page for the initial view. I really liked how the paints and water were reacting on the paper. The cold temps (37 degrees) seemed to make the paint take longer to dry so I painted the blue box to be ready for the final show. Then, I moved onto a Fabriano HP sheet - also new to me. I love painting on a HP finish. It's very immediate and there's very little you can do as far as corrections are concerned. It encourages freedom! I did three vignettes, working from left to right. You can see my stop and start marks. This brand of HP is a bit softer than Arches. I'm going to really enjoy working with it. I hope you, too, were able to enjoy this glorious celestial event! Oh, I knew you'd see it and paint it for us all to share!!! Wish I could have been sitting with you staring at the sky and enjoying it - who else is that crazy? ha ha What a way to bring in the winter!! In the end - it was cloudy here and no chance of seeing it. How marvelous that you did. I so enjoy your painting of it. Despite the many challenges—design, new paper, cold temps and the middle of the night, I'd say your pages are very successful! I saw it just before 4 am with that beautiful fiery copper glow—just gorgeous and you've captured it here! Wonderful paintings! I love HP paper too, and while I always think I should plan better, I also like the process of how it develops. Sometimes it works, and sometimes it doesn't, but the process is fun. 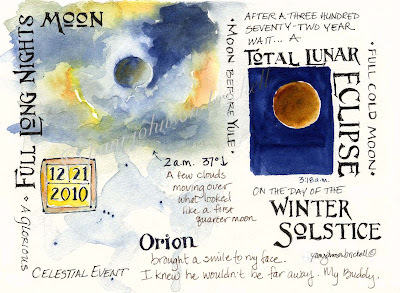 Our skies were clear and the moon was bright that night - I got up for the beginning of the eclipse and thought of you! Thanks, Laure! I'm glad I remembered to have my bins. The colors were much richer look thru them then without. I can see why Kate loves Fabriano paper. Think I'll finally make a bound book with it and Canson Edition. I love the tips you give. Thanks so much for sharing your wonderful work. Thanks for stopping by, Lydia and for you kind comments! Oh my gosh! This is sooo cool. I love that you got out there to paint it live. We unfortunately were socked in with a thick cloud covering. I love your images for the historic event. Had to think of you when I heard about the eclipse Pam. But I had no idea the lengths that you'd go to see and portray it. Bravo!